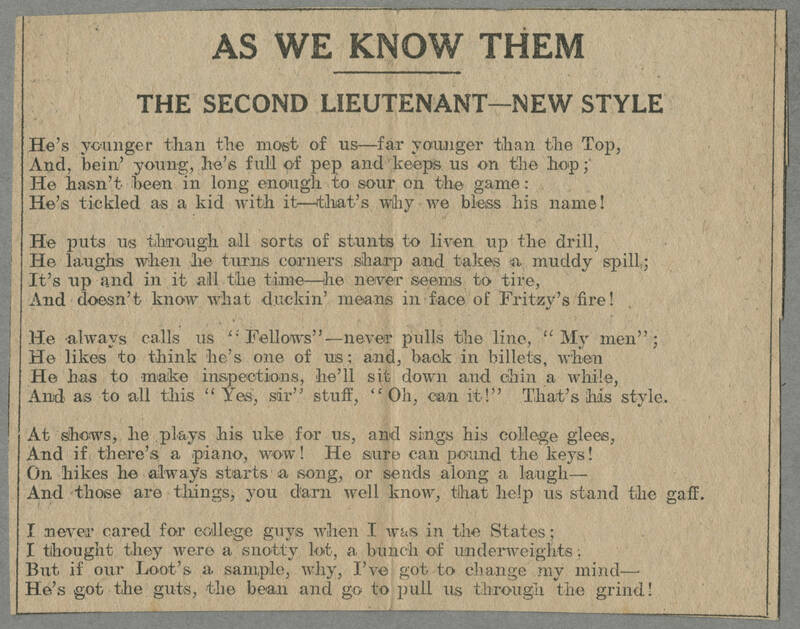 AS WE KNOW THEM THE SECOND LIEUTENANT---NEW STYLE He's younger than the most of us---far younger than the Top, And, bein' young, he's full of pep and keeps us on the hop; He hasn't been in long enough to sour on the game: He's tickled as a kit with it---that's why we bless his name! He puts us through all sorts of stunts to liven up the drill, He laughs when he turns corners sharp and takes a muddy spill; It's up and in it all the time---he never seems to tire, And doesn't know what duckin' means in face of Fritzy's fire! He always calls us "Fellows"---never pulls the line, "My men"; He likes to think he's one of us; and, back in billets, when He has to make inspections, he'll sit down and chin a while, And as to all this "Yes, sir" stuff, "Oh, can it!" That's his style. At shows, he plays his uke for us, and sings his college glees, And if there's a piano, wow! He sure can pound the keys! On hikes he always starts a song, or sends along a laugh--- And those are things, you darn well know, that help us stand the gaff. I never cared for college guys when I was in the States; I thought they were a snotty log, a bunch of underweights. But, if our Loot's a sample, why, I've got to change my mind--- He's got the guts, the bean and go to pull us through the grind!